Welcome To Donte's New Website!!!! More Information Is coming Soon. We are located at 20850 Sheldon Rd Brook Park, OH 44142-1219.Our phone number is 440-243-0342. Our fax number for placing orders is 440-243-5350. 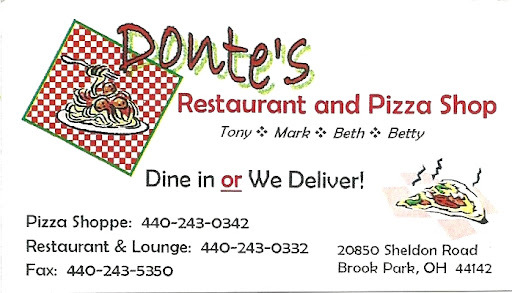 This website will give you everything you need to know about Donte's Restaurant, including the daily soup/special, menu and pricing, information on the party room,and much more. Come Like us on Facebook!!! !